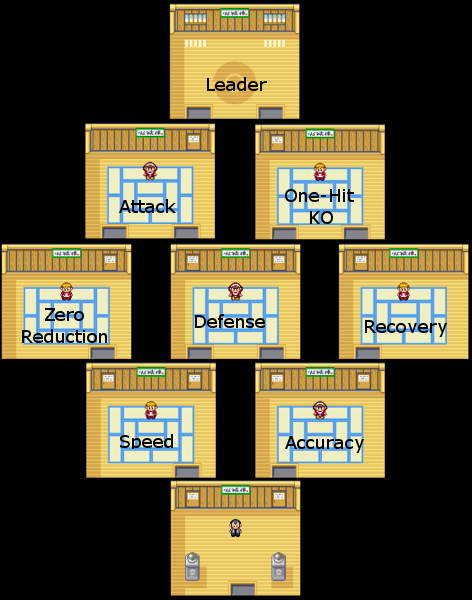 This Pokemon Ruby and Sapphire Gym Leaders gives you all the information, resources, and strategy you need to navigate the gyms and defeat all 8 Gym Leaders in Pokemon Ruby and Sapphire. Fighting type Pokémon are weak to Flying, Psychic, and Ghost but strong against Normal, Dark, Rock, and Steel. Ralts and Tailow are good choices for this gym. The gym is dark, but the circle of light around you will expand with every trainer you defeat. The quickest way to the leader is by traveling right, up, left, up, right, down, right, up. You'll avoid two trainers this way, but you might want to face them for expirience anyway. Brawly has two Pokémon, Machop and Makuhita. If you have the type advantage, Brawly should be defeated very easily. Typically, you'll be able to get a few hits off before any of his Pokémon will even deal damage. You'll receive the Knuckle Badge and TM08 - Bulk Up for winning. You'll also be able to control Pokémon up to level 30 and use HM05 - Flash outside of battle. Mauville Gym is Electric type, so a ground Pokémon will take you through the gym in a breeze. Avoid Flying, Water, and Electric types, but anything else will get you through alright. 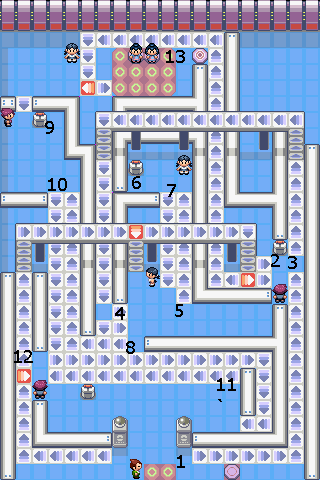 The puzzle in this gym is very easy, there's a few simple switches on the floor that move electric currents around. There's also four trainers in here that you can use to train before facing the gym leader. Wattson is a step up in difficulty compared to the previous two leaders, you may need to exit the gym and train before beating him. Watch out for Selfdestruct from Voltorb and SonicBoom (always does 20 damage) from the other two, both of which can be deadly. Wattson also has a nasty habit of using Super Potions when his Pokémon are running low on health. If you manage to defeat him, he'll hand out the Dynamo Badge (raises the base Speed stat of all of your Pokémon and allows you to use HM06 - Rock Smash outside of battle) and TM34 - Shockwave. Lavaridge Gym has a speciality of fire type Pokémon. Recommended types are water, rock, and ground which are all super effectives. Avoid any grass, bug, or steel types. 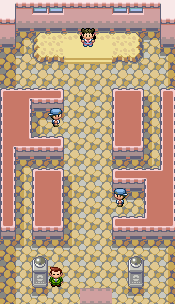 The quickest way to navigate the gym is to enter the holes as follows: Left, left, top-left, right, left, top, top-right, right, bottom-left, bottom. This should take you to the gym leader, Flannery. The two Slugmas shouldn't give you much trouble. Torkoal becomes problamatic with Attract, which will render all your Male Pokémon basically useless. Watch out for Overheat which is a heavy hitter. As always, take into account the nasty use of super potions just when you think you've sealed the deal. You'll be awarded with the Heat Badge (All pokémon up to Level 50 will obey you, you can use HM04 - Strength outside of battle) and TM50 - Overheat. Fighting, Rock, and Steel are all good choices for Petalburg Gym. Ghost is also an excellent choice if the Pokémon knows non-ghost moves (Normal and Ghost types can't affect each other). Each room in the gym focuses on a different stat (attack, accuracy, speed, ect.) and the trainer will use items that boost that stat. You'll need to face three trainers of your choice before taking on the fifth gym leader, your father. Norman can be a fairly tricky gym leader, his Pokémon all boast a heavy HP stat. Be careful about burning, poisoning, or paralyzing, because all of his Pokémon know Facade which deals double damage under these conditions. Just when you're about to KO a Pokémon Norman will use a Hyper Potion, so plan accordingly. Upon winning your father will state both his fatherly pride and gym leaderly dissapointment and give you both the Balance Badge and TM42 - Facade. The balance badge will allow you to use HM03 - Surf outside of battle. Fortree Gym specializes in Flying type Pokémon. 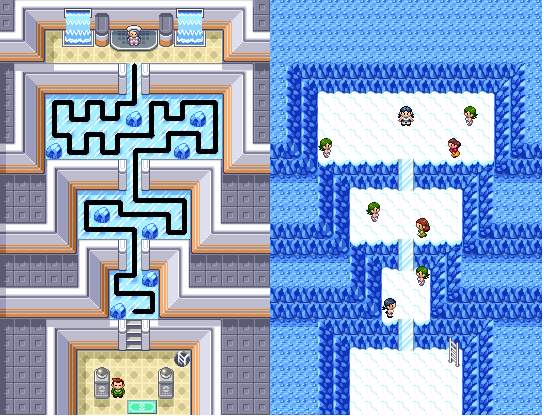 Electric is the best type to use; Rock and Ice are also very effective. Avoiding using any Bug or Fighting types. 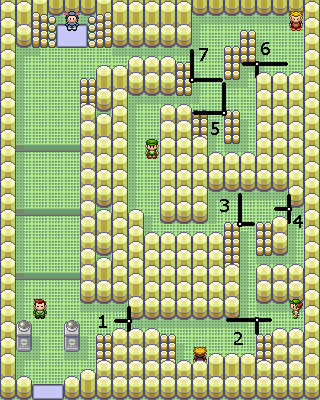 You'll have to solve switching gate puzzles to navigate this gym. 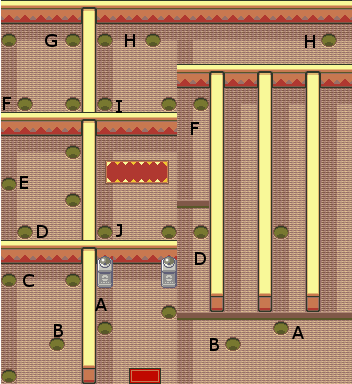 Use this Fortree Gym Map and the following instructions for the quickest route: gate 1 right, gate 2 right, gate 2 down, gate 3 up, gate 3 right, gate 4 right, gate 3 up, gate 3 right, gate 3 down, gate 4 left, gate 5 right, gate 6 right, gate 6 down, gate 7 down, gate 5 up, gate 6 right. You'll face four trainers along the way with 1-3 Pokémon each. If you have a type advantage, Winona is a piece of cake. Even if you don't, she shouldn't be too much trouble. However, Altaria's Earthquake can deal massage damage if you're not careful and Winona has two Hyper Potions to use if you let her. You'll get the Feather Badge for winning which allows you to use HM02 - Surf outside of battle and all Pokémon up to Level 70 will obey you. Winona also awards you with TM40 - Aerial Ace. Mossdeep Gym Leaders Tate and Liza specialize in Psychic type Pokémon, although the unique dual-typing, moveset, and abilities of Lunatone and Solrock make it very hard to gain any sort of type advantage over them; Water and Ghost will be your best bets. 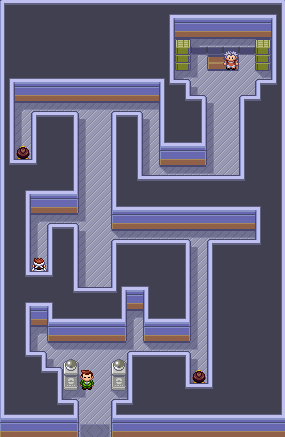 Navigating the gym can be tricky, you'll need to take the directional moving paths and hit switches along the way. Use the map above and follow the numerical directions for the easiest route. For the first time in Gym Leader history, there's actually two gym leaders. You'll fight both of them at once in a 2 versus 2 double battle. This battle is fairly difficult, you'll need to watch out for Lunatone's Hypnosis and the multiple Hyper Potions that will be used just when you think you've won. We recommend a Pokémon that knows Surf, as you'll have the type advantage and be able to attack both Pokémon at once (although Sunny Day does reduce the effectiveness of Water attacks). As long as you've trained your Pokémon well enough, you should be able to defeat Tate & Liza. You'll get the Mind Badge and TM04 - Calm Mind for winning. The Mind Badge raises the Special Attack and Special Defense of all of your Pokémon and allows you to use HM08 - Dive outside of battle. Thanks for using our Pokemon Ruby and Sapphire Gym Leaders guide!